Eradicate this fear once and for all with this handy reference guide for SEO writers/copywriters. . You can use the in-depth answers as “cut-and-paste templates” when you respond to clients – whether via email or phone. I decided to write this ebook because, as a freelance writer since 1993, and a search engine optimization (SEO) copywriter since 2007, I get a lot of questions from fellow freelancers about what to expect from SEO writing clients. Learn more about me on the “About” page of InkwellEditorial.com. Template Answers Right at Your Fingertips! Most of these are questions I’ve received from actual freelance SEO writers since 2007. You can use the in-depth answers as “cut-and-paste templates” when you respond to clients – whether via email or phone. New freelancers particularly seemed scared to death of client interaction. As SEO is considered somewhat of a technical form of writing, it’s understandable to be a little freaked out if you’re new to the niche. Because SEO is a constantly changing field, it can take some time to understand the concepts around it and to get comfortable speaking the language of this niche (eg, keywords, keyword density, anchor text, organic search, etc.). 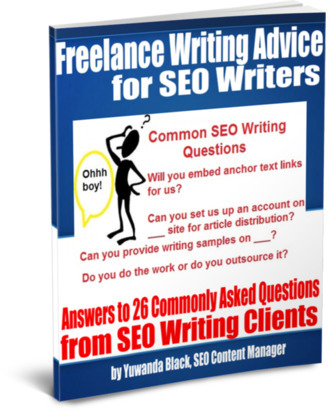 So this ebook will serve as a handy “SEO writing reference guide,” if you will – for new SEO writers and those who just want somewhere they can go to get answers to the questions they’re most likely to receive from clients when they start this type of freelance writing career. Also within, I’ll give a step-by-step tutorial on how to find answers to questions you may have that are not covered within. I’ll also share some insight on how to handle it when a client simply stumps you, ie, you’re put on the spot and you literally can’t find an answer. The following questions are answered – in depth – in this e-guide. 1. We’d like to speak with someone [via phone] about our SEO article writing needs. Can you get back to us and let us know how/when this can be arranged? 2. How much do you charge to write SEO content? 3. Do you offer a bulk rate if we order more than a certain number of articles? 4. What’s your turnaround time [for producing content]? 5. Do you write the content or do you outsource it? 6. Does/will the copyright belong to us? 8. Do you provide the keywords or do we? 9. How much additional if we want you to do keyword research? 10. What do you need as far as direction? Is a list of topics and/or keywords enough, or do you prefer more guidance? 13. How many keywords (aka “keys”, “keyword phrases”) do you need to get started? 14. Can you/will you upload the copy for us to XYZ site? 15. Will you distribute the copy for us (eg, to article marketing directories, free press release sites, etc.)? 16. What is article marketing? 17. What’s the difference between a blog post and a regular SEO article or regular web page? 18. Will you put in the anchor text for us? 19. How much would it cost if we want a longer article than the one stipulated on your website? 20. We’d like to hire you to provide ongoing content for our site, eg, one article per week. Can you bill us monthly? 21. Can you forward some writing samples in our niche? Or, can you write an article on ABC (our niche) so we can see if you’re capable of handling our content needs? 22. Can you write articles on ABC subject? 23. Can/will you rewrite/edit existing content we have that we want to repurpose? 24. Can you set us up an account at XYZ site? 25. Will the content you write be 100% original? 26. What do we need to do to get started?